According to a legend, the area around here was called Yaturugi Village, and the deity of this area was called the Yaturugi Deity. (Yatsurugi means eight swords.) During the reign of Keiko Emperor, his son, Yamato Takeru was making his way towards theeastern area of Japan to conquer it. When he crossed the Uraga Channel, a fierce rainstorm occurred and the ship was almost capsized Princess Tachibana said "This is because you said that when you saw the channel you said that the sea was so small that you could jump it and cross it easily." Suddenly she threw herself from the ship to ease the deity's anger. Then Takeru crossed the sea snd reached Yaturugi Village. He lamented over his wife's death and stayed at the village for some time. This is the origin of the place- name, Kisarazu. Kisarazu means 'You never leave' in Japanese. Minamoto no Yoritomo dedicated land and built a shrine pavilion as he founded the Kamakura Shogunate. In November 1591, Tokugawa Ieyasudedicated the land and issued a so-called vermilion sealed document to confirm that the land is the shrine's property In November 5th 1614, the Siege of Osaka Winter Campaign took place. A lot of boatmen were hired by Ieyasu. They worked remarkably well under the command of Mukai Tadakatsu and ObamaMitsutaka They felt grateful about this shrine and the deity. 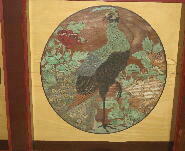 After that, a priest was invited to Sumpu Castle and given a bronze bird statue and silver. In 1752, a big fire destroyed the shrine pavilions. In 1773, the shrine pavilions were reconstructed. In 1793 it was repaired, in 1914 it was repaired fundamentally. And in 1871, the shrine was classified as gosha-class. 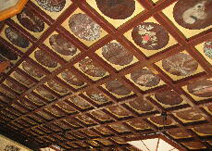 In 1980, on the occasion of pavilion renovation, all 162 paintings on the coffered ceiling were restored. Now, Yaturugi Deity is enshrined here as a deity of protection, for safe driving, safe delivery, prayer for the children's growth and future, business success and academic success. On November 5th 1614 , Tokugawa Shogunate paid gratitude to Kisarazu Village by dedicating land named Kisarazu Port in Edo. Permission to use the port, a bronze bird statue and silver were given. The statue was put up in a gorgeous Japanese style lacqured wooden box with a crest of hollyhock. This ground plan shows the shrine's boundaries Even the points where the stakes were driven are shown. From the torii gate standing at the present shrine precinct straight to the shore was the shrine precinct at that time. The distance is also shown. There is an interesting sentence, "It's impossible to drive stakes here because of the tide". Yabusame horse-back archery ground was placed perpendicular to the approach. We would say that the national road makes a right-angle turn in front of torii gate so as not to hit the horse-back archery ground. 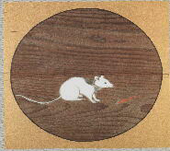 The sign and seal of the villager of importance who worked for the shrine is shown on the plan. Kisarazu city-designated cultural property These were painted with influence from the Kano School by a painter in 1773, when the shrine pavilions were reconstructed. In 1980, on the occasion of renovation, the member of the Education Ministry's old pictures preservation committee, Tanaka Yuzuru restored them. 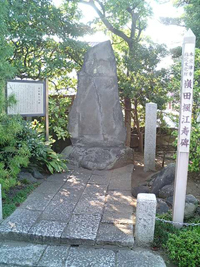 Kisarazu city-designated cultural property This was dedicated in early Meiji era. 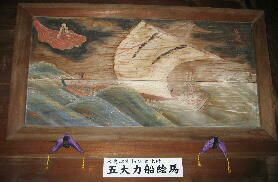 The wind ships were given special privileges from the Tokugawa Shogunate and sailed between Edo and Kisarazu. It was constructed in June 1850. This is said to be the biggest and heaviest portable shrine in Kanto area. In September 1992, the Chinese government calledon it and it was brought to Beijing and shown on the commemoration event for the 20th anniversary of normalization for Japan- China diplomatic relationship. In September 1993 it was shown at the Makuhari Messe to commemorate the 120th anniversary of Chiba prefecture's birth. In September 1987, three great portable shrines were gathered in Kisarazu as a part of commemoration ceremony at the opening of the Tokyo Bay Aqua-Line. Each portable shrine was from this Yaturugi Hachiman Shrine,Tomioka Hachimangu Shrine in Fukagawa, Tokyo and Torikoe Shrine in Asakusa, Tokyo. 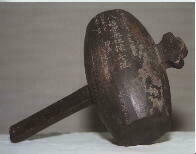 This bell was dedicated on the 8th of November 1410. 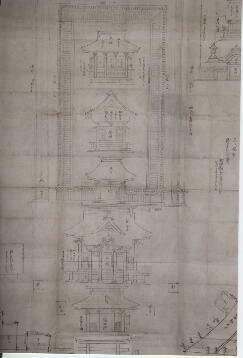 In 1565, the shrine gave a talisman to bring good fortune for war to the lord of Oyumi castle, Hara　Kazusanosuke Tanesada. This is a thank-you note from him.